An iconic piece of Speedway history will go under the hammer to coincide with the tenth and final running of the Scott Darley Sprintcar Challenge this season - and it doesn’t get much bigger than this. Over the years, the Darley Family have nominated different charities for monies to be raised over the Scott Darley Challenge weekend in Scott’s memory and most recently that has been focused on a man who has been instrumental in the event’s process. This year it goes another level entirely. The lovingly restored #1 Litre Car that Scott won the 2004 Australian Championship in, will be auctioned off, with the proceeds going to Garry Coleman OAM’s Motor Racing Ministries. It really is the last piece in the emotional puzzle for Bruce, Rhonda, Luke, Kate and Jayne Darley, as the curtain comes down on the ten-year legacy of the Scott Darley Challenge that honors Scott’s memory. The car, which is in pristine condition, would best suit a collector rather than someone who wishes to race it. “Back in the day it was one of the quickest cars in the country,” says Bruce Darley, “Scott proved that by winning the Australian Title. The cars have evolved a lot in the last few years though and it wouldn’t be a smart proposition to race it. 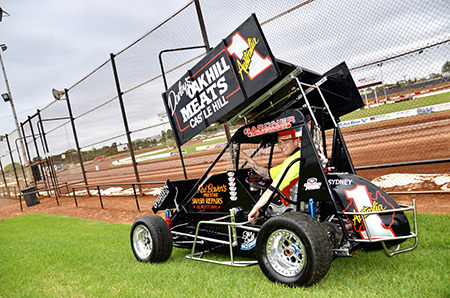 That generosity (donating an entire racecar, particularly with the sentimental value that it has for the family) from The Darley Family over thirty years within the NSW Speedway kart, Litre Car and Sprintcar community is legendary. Putting others before themselves is a hallmark of their family, and indeed something that Scott was actively known for during his racing career. Before he tragically lost his life in a crash at Parramatta, his major focus was on raising money for ‘Cure our Kids” – a drive to help sick children that remained a focus in the early part of the Scott Darley Challenge race itself. For ten years the Scott Darley Challenge has been the most prestigious race in NSW Sprintcar history; the 2018/2019 running will however be its last. Details on how the #1 Scott Darley Australian Litre Car Championship entry will be auctioned or purchased will be released in coming weeks.